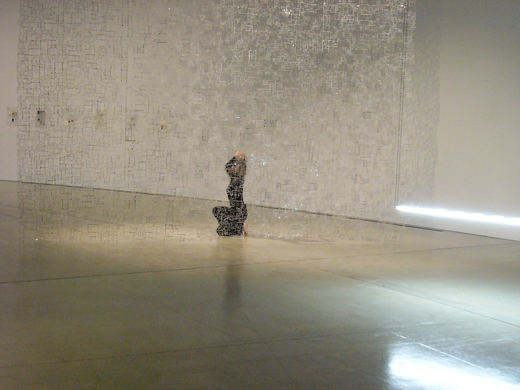 Today British dancer, Sioned Huws, who is staying in ACAC for her next program, danced in front of the YAMAMOTO Seiko's work. A few days before, she collaborated with Angie's work and expressed her understanding of the work by her body expression. 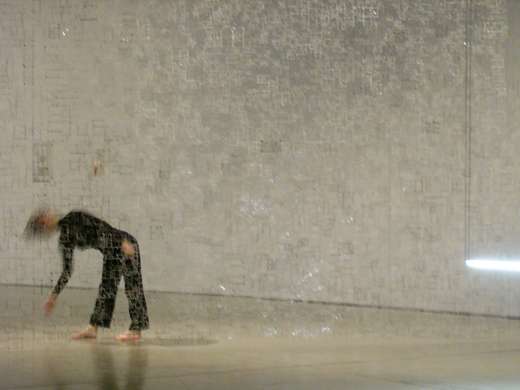 It seemed the dialogue with sound and body. 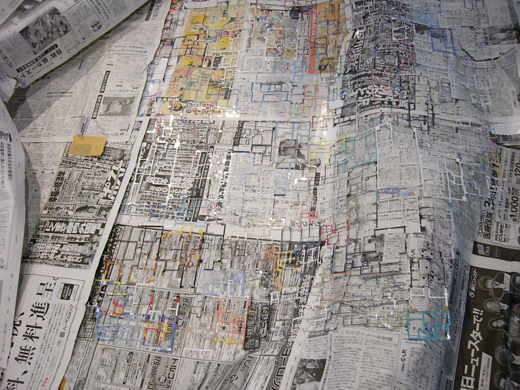 After confirmation of the space, she did the repetitive movements, and expressed some impressions about the sensibility of work that affected the space. 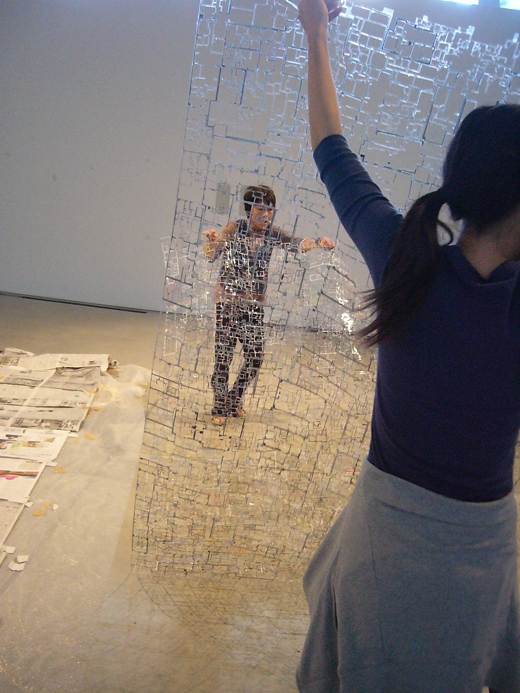 Sioned expresses her understanding and reading for the Seiko's artwork using her own body. It is the same as we write text. Also we could understand what she would like to say though this non-verbal language. 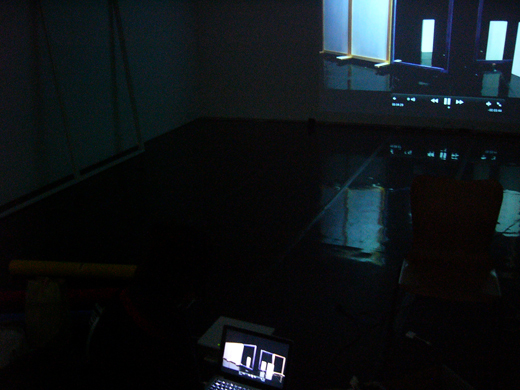 Today we went to Hachinohe with Sanghee to shoot for the ongoing project "1983" (a part of the work have exhibited in ACAC now). She would like to shoot shoes floating in waves. The shooting started at 4am! 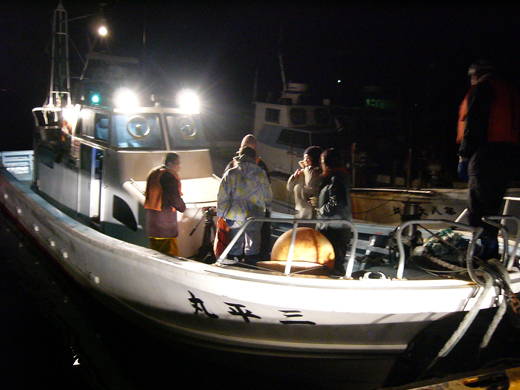 The Captain of the Sanpei-maru helped us a lot. The small one is the boat. 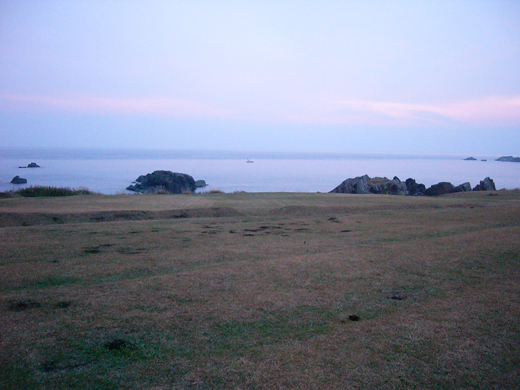 I was waiting at the Tanesashi coast. I can see beautiful scene there at 6am. 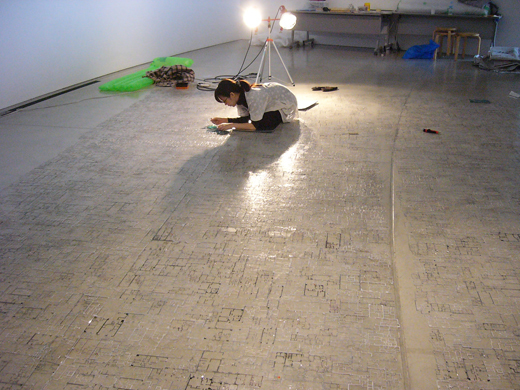 We will be able to see her new work somewhere in the near future. The couped sky. It became a new favorite place for dragonflies. Mirror in the mirror betrays images. 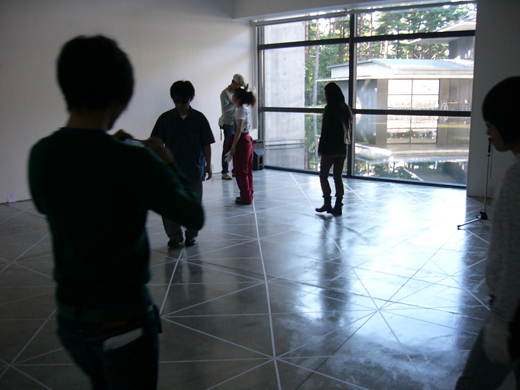 On standing at the space of ACAC, all artists were thinking for a while about the way how they realize the idea and how they deal with all conditions here to do their best here. Gradually the final form starts appearing. 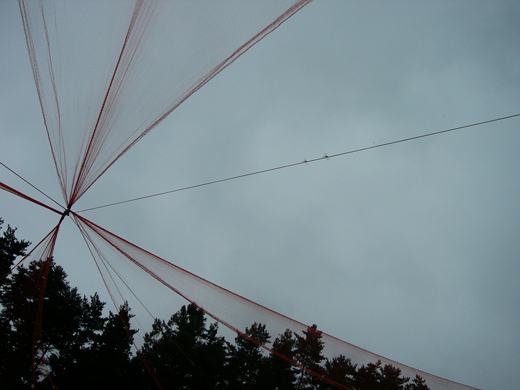 We can see the trajectory which the idea or concept forms reality. I see it is the benefit of the artist in residence. 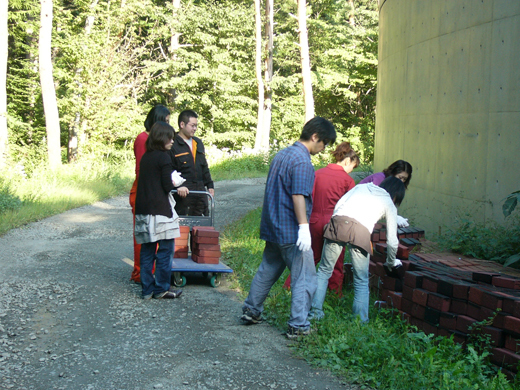 TSUDA Michiko, a media artist, is working to produce the set for the shooting with volunteers. It is in the final stage. The photo image gives different image from the reality. Tomorrow she will start shooting. What kind of image will be produced here? Finally Angie decided how to make the floor. 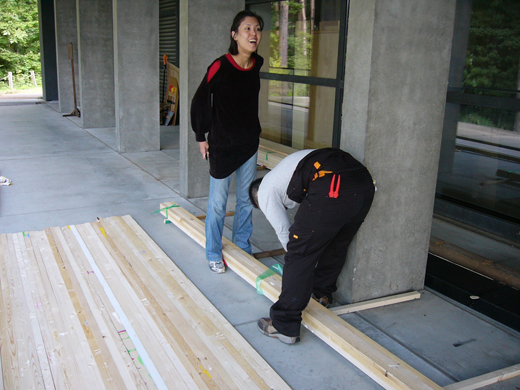 Now she is preparing small piece of wood for it. 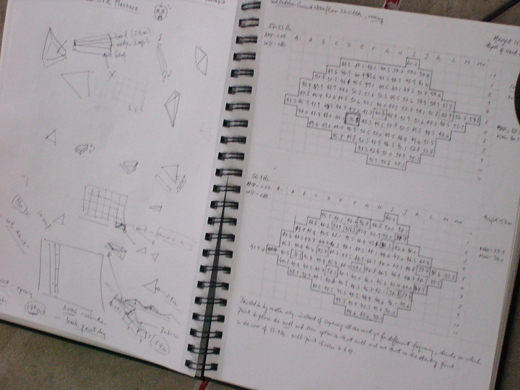 Many calculating formula for it is written on her notebook! A test piece. It looks flat but there are slight differences in height. 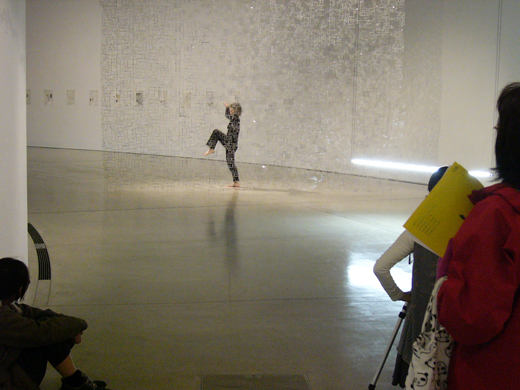 On her artwork here, people can experience some gaps from the body and ears. 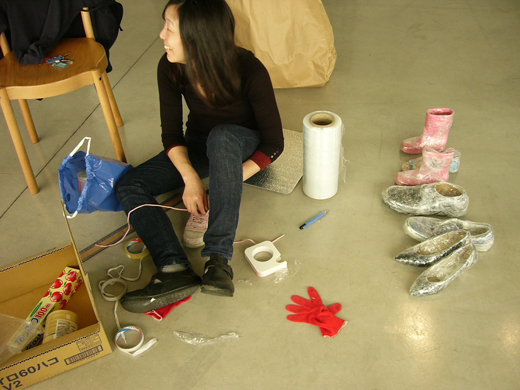 Sanghee continued wrapping shoes with a volunteer. 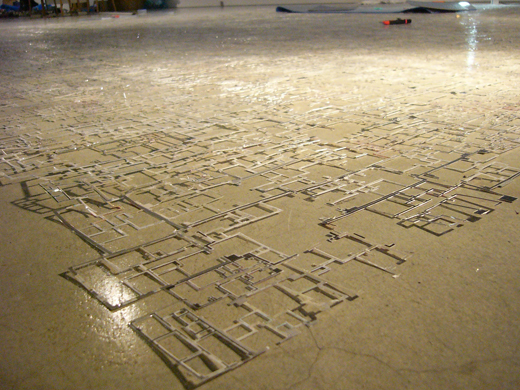 AMAMOTO Seiko was combining small pieces of the floor plans which were laminated and cut out. It seems a lot of workload. This is the outside work of KANO. 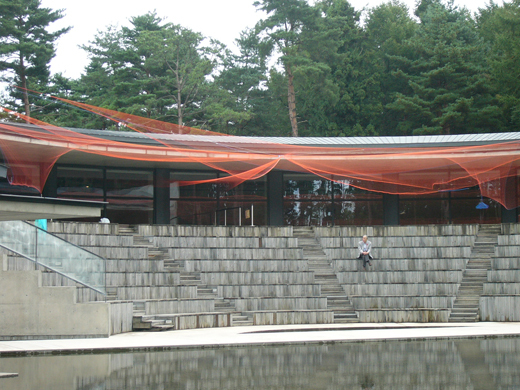 The artwork connects the inside and the outside, the building and the forest. The observer's eyes will be shifted. But it started raining hard and the outside work had to be canceled today. Artists don't spend all time for work. 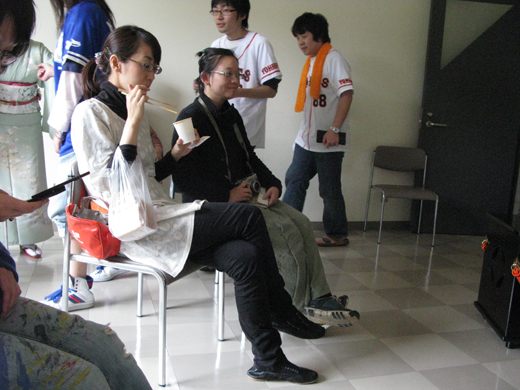 Today is the festival of Aomori public college. 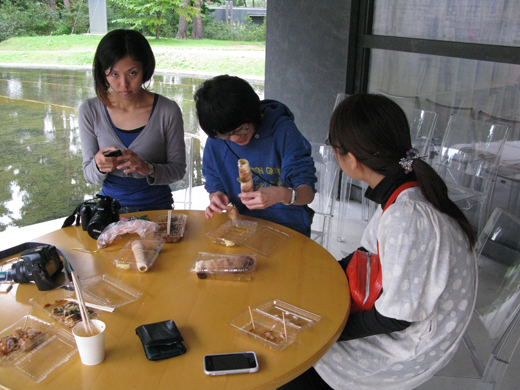 On the lunch break, they went to see the college festival. 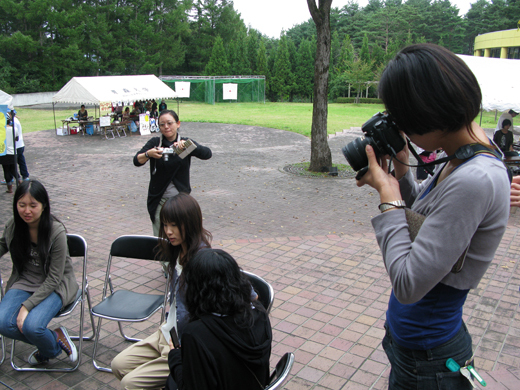 Angie and Michiko were taking many photos. 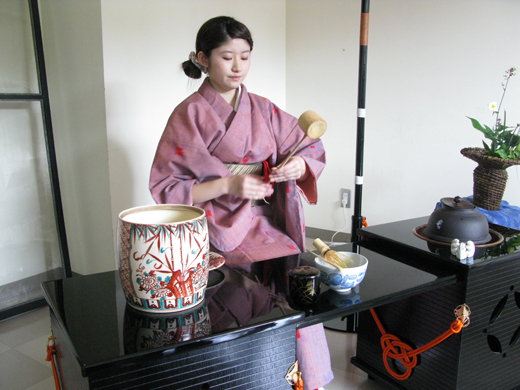 Some students who helped previous AIR program are preparing tea! 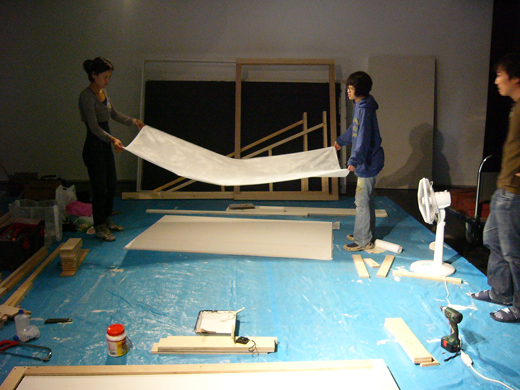 ACAC also had a open studio today because of the college festival. He was looking at artist's work seriously. 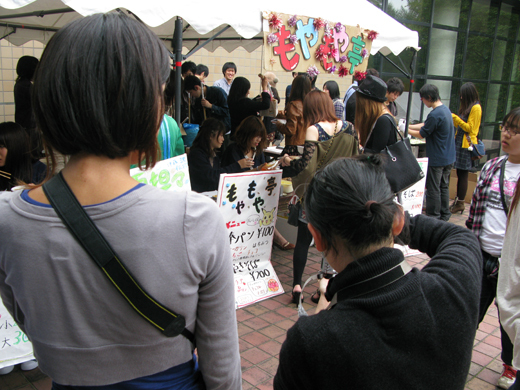 The college festival is held tomorrow too, and the open studio tour starts from 13:00 on the 10th, too. 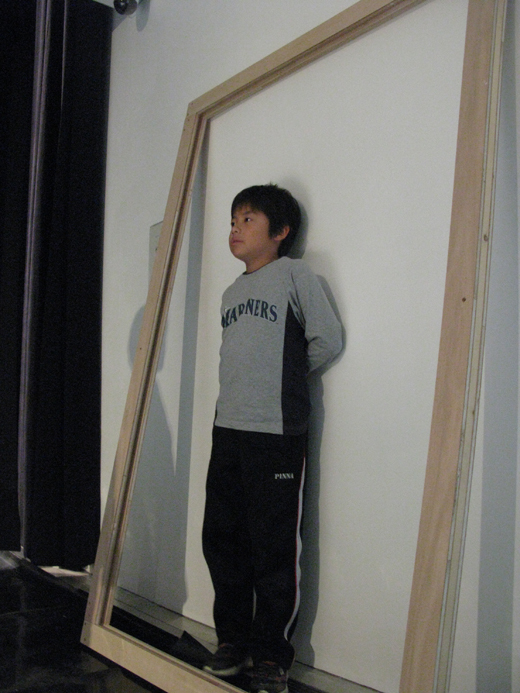 Today Yamamoto gave a workshop for 56 children (8 years old). 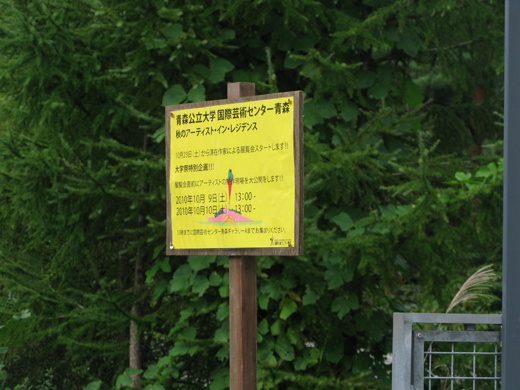 The title is "Let's make fairy in the forest!" 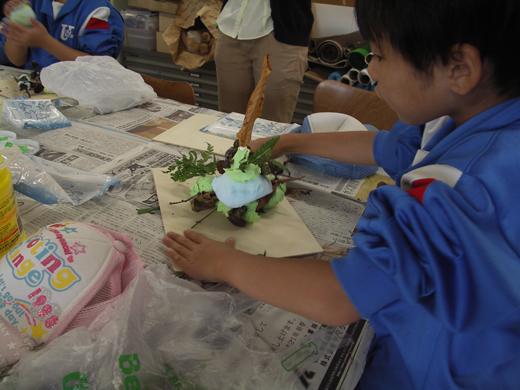 Children made a strange animal from paper clay with branches and leaves that found in the ACAC's forest. About the detail, please see the previous blog. 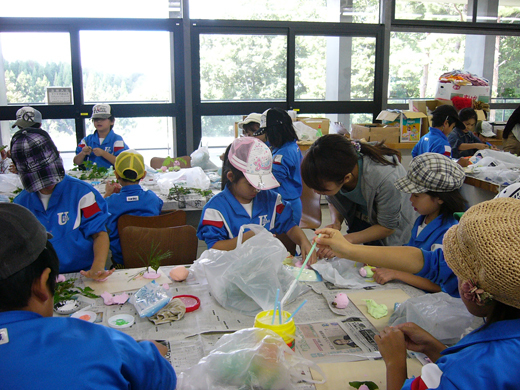 The interesting point is the insert of the contingency to the children's creative activities. Children didn't produce anything with latitudinous idea from the beginning. 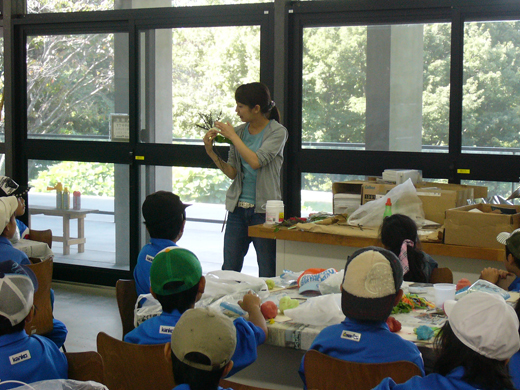 Even if Yamamoto said "let's make never-seen-before animal", children tried to make something that they already know, such as squirrel, fox or princess. 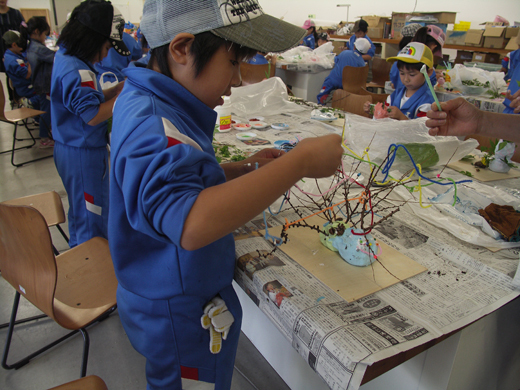 But once they started to use branches and leaves, it seemed that they were inspired and stimulated their imagination, and they started to produce "something". 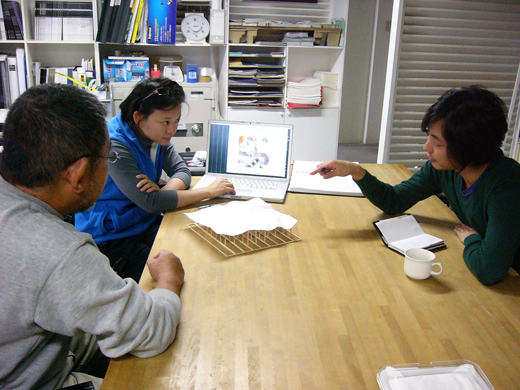 It is her intention and make this workshop interesting. 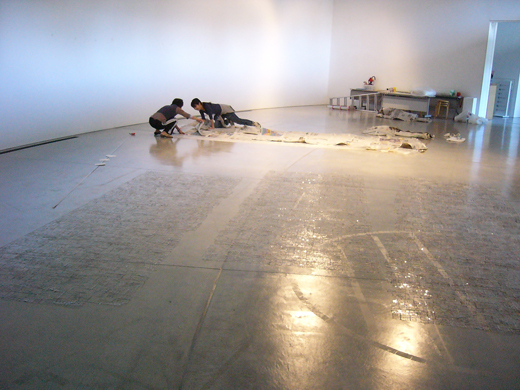 When she gave workshop to children, other artists were working in the gallery. 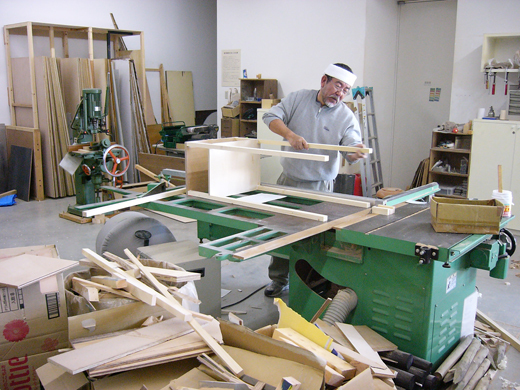 This is Tsuda, media artist but recently she was working on the wood working. She set the stage for filming. 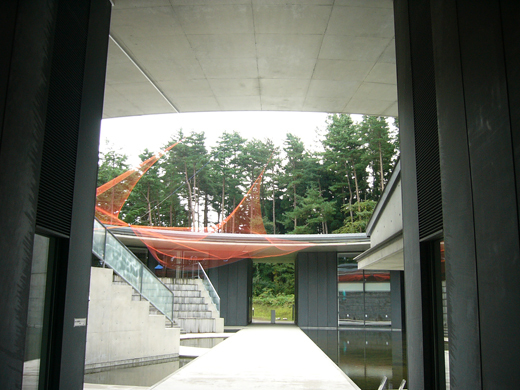 It has special atmosphere. 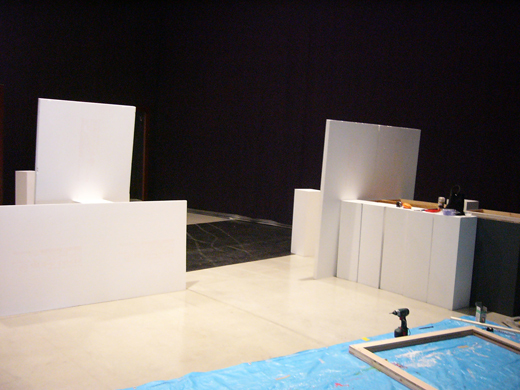 Kano is constructing space now. 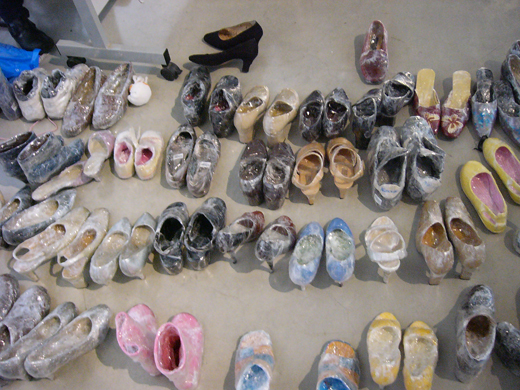 The materials are daily necessities but it seems they become anonymity once they are re-constructed. 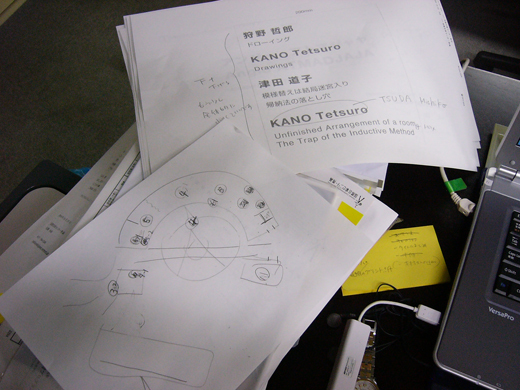 Sanghee who is shooting the working Kano. Sanghee is wrapping shoes that volunteers collected and gave her. It seems that artists start to warm to the work. 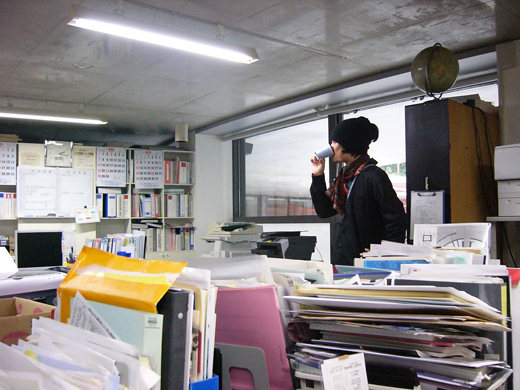 After arriving here, Sanghee started to look for places for filming for her artwork. After she decided the place, the time schedule and contents, we go to meet with professional camera man to consult about shooting, equipment, editing and so on. 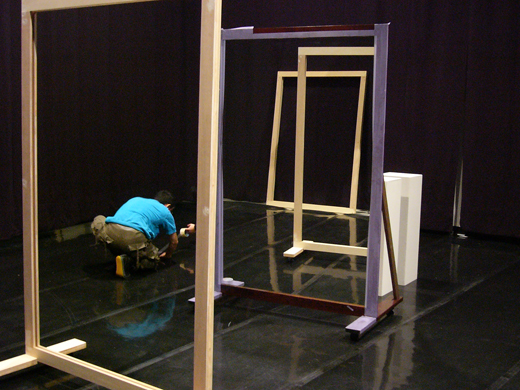 He is working on the TV company as a camera man and helped previous AIR artist, too. Everything progresses with someone's help. 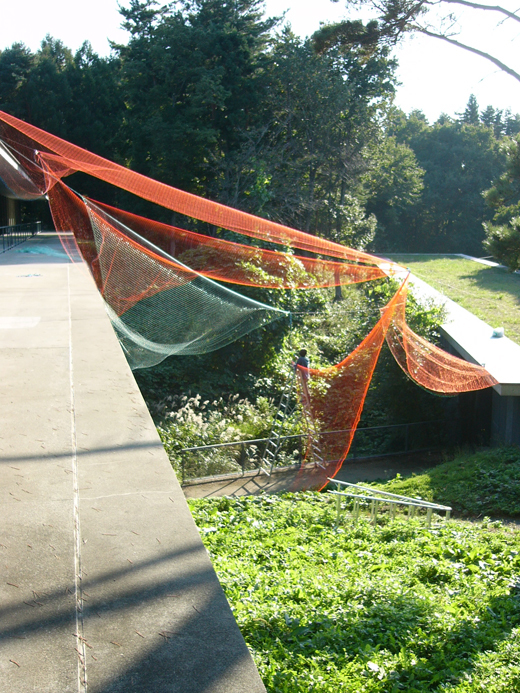 It is not only just the collaboration with artists and city, but also it is more fundamental thing when people live. I feel that we are experiencing such kind of fundamental thing during the condensed AIR period. Today is the first Sunday after the first meeting. 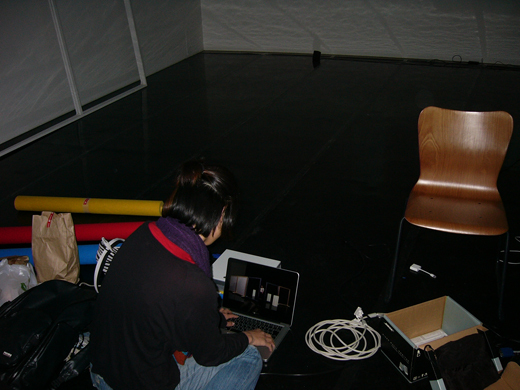 All artists start to work with volunteers (AIRS-Artist in Residence Supporters & staff of 24 our TV), or have another meeting to realize its plan concretely. 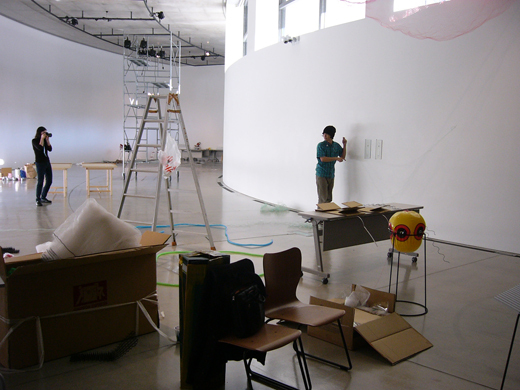 YAMAMOTO Seiko is opening the big package with AIRS in the Gallery A. In the package, there is the parts of her outstanding work. It seems strong than I thought it would be. How will she show it? 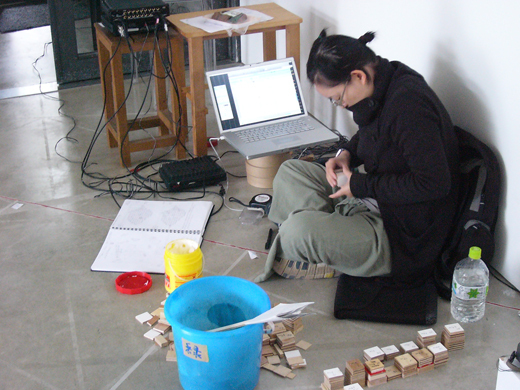 This is a sound artist, Angie Atmadjaja from Indonesia, currently living and working in U.K.
She uses this very phenomena as an artistic expression. 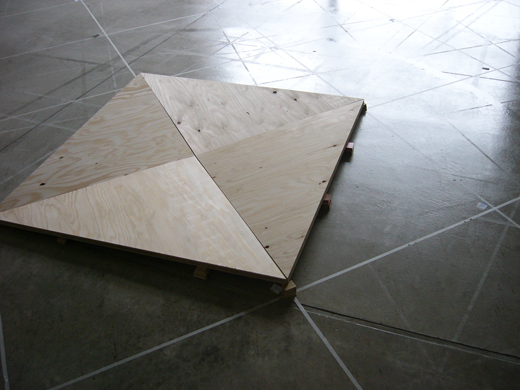 And this is the maquette of the sound distribution in the gallery B. 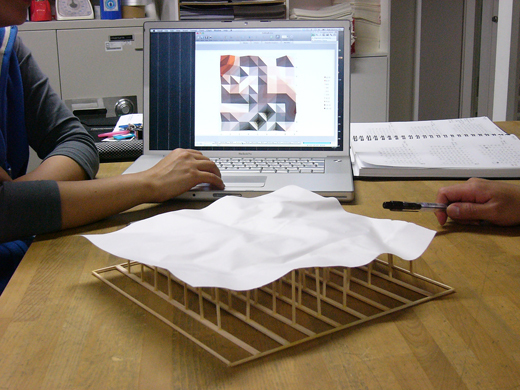 But because it is a bit difficult idea, Angie and we have a talk to the AIRS members who are an architect about the methodology . 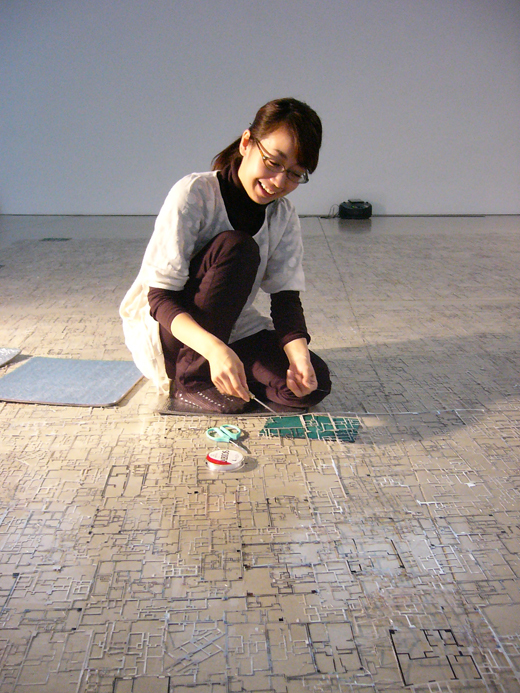 This is TSUDA Michiko, media artist. Even if she is a media artist, she needs to do the wooden work. It will make her perfect image world! Maybe. 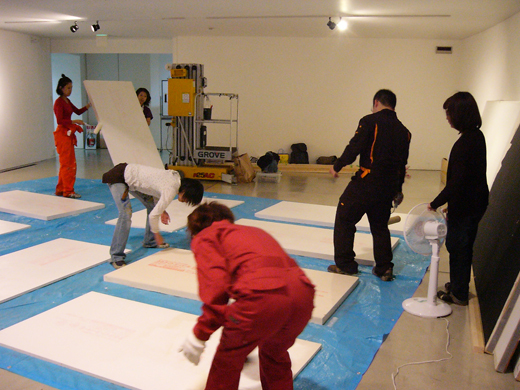 The volunteers who helped previous residence artist unit "Nadegata Instant Party" are helping her work now! 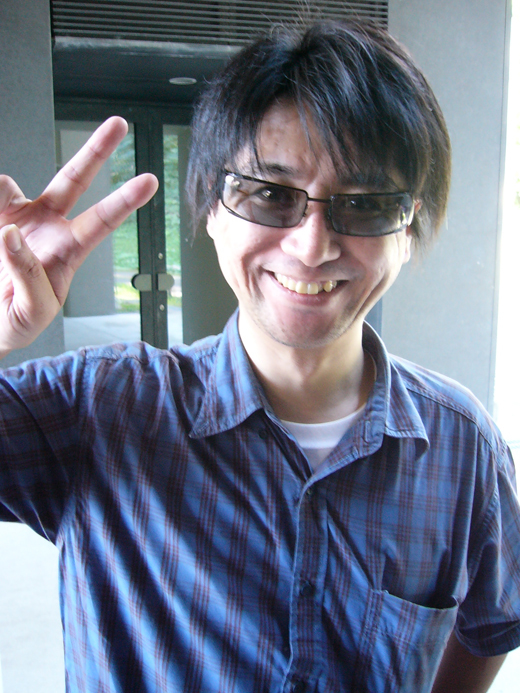 This is Yamagami, the vice- president of AIRS. You can do it! 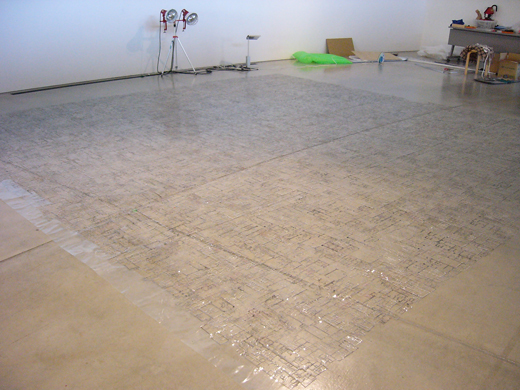 And then we experienced Angie's work in process all together. It is "Surprise" that the sound is changing according to the place. It seems like dance performance. 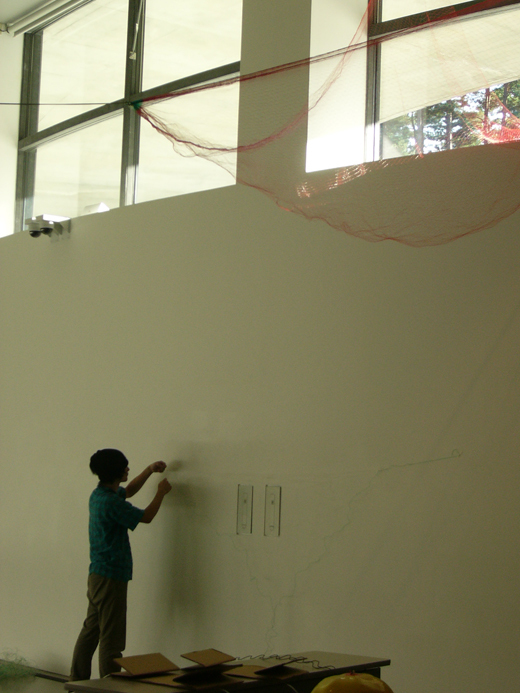 Even if you can see the artist around ACAC, it is not off work. 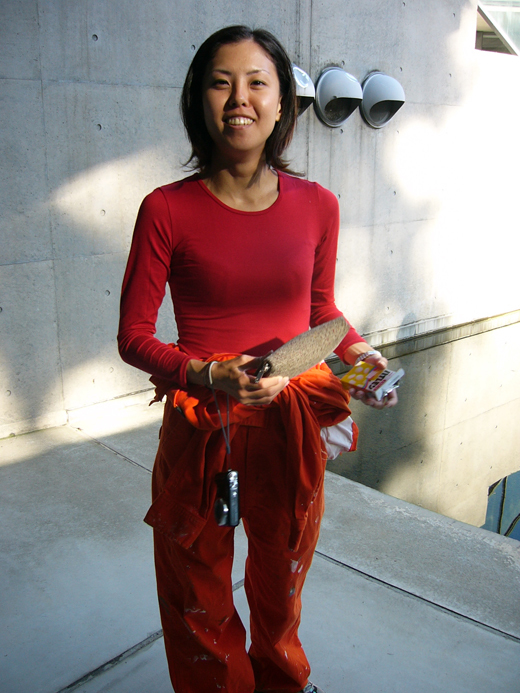 This is SONG Sanghee from Korea, currently lives and works in the Netherlands. She was editing her film all day long in her room. 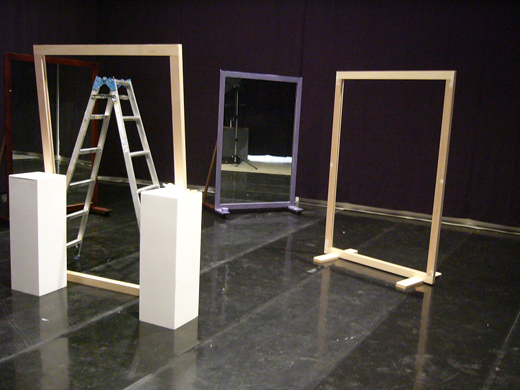 Artist in Residence program 2010/ Autum starts! 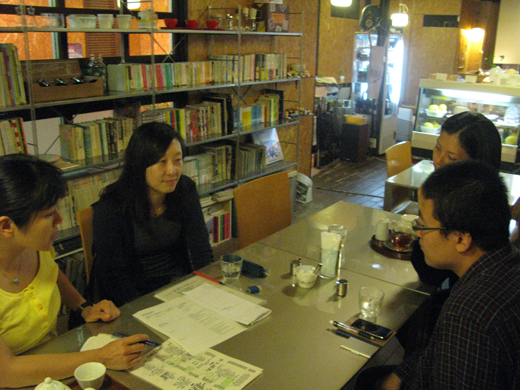 5 artists from Japan, Korea and Indonesia came to Aomori. On this time, the program theme is "BIKKURI (something surprising)". Without quoting a passage, "astonishment carries and pervades philosophy" by Aristotle, astonishment provides the diving force for quest or investigation. When artist meets material, when a chance is brought in to the artwork, when something becomes “artwork”, there must be various astonishments. 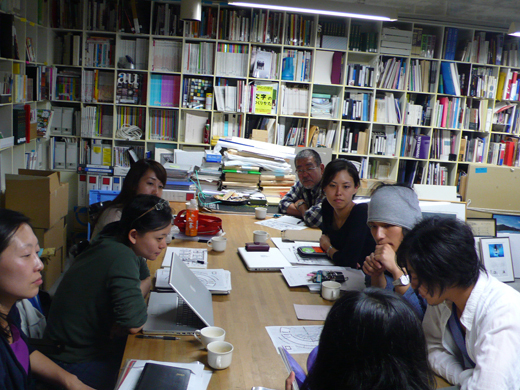 Today we had a first meeting with all artists, curators and technician. 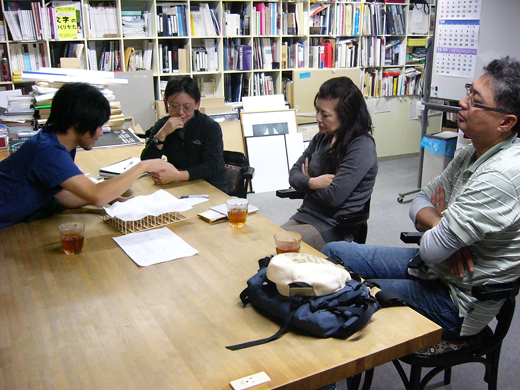 After self-introduction, each artist explains the work plan that will realize here. The place determination is the most important meeting at the beginning. We are looking forward what happen from here.